Tuscany or Toscana is one of the most famous regions in Italy. 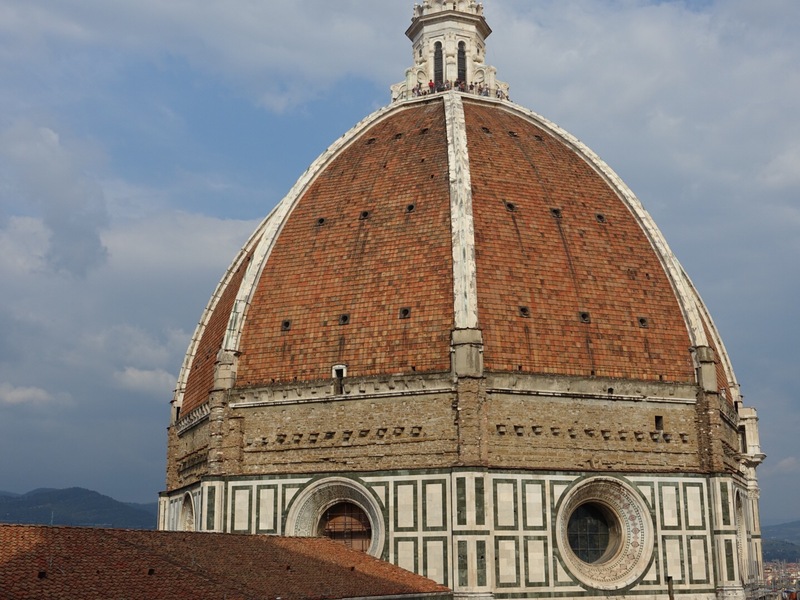 Since Frances Mayes wrote “Under The Tuscan Sun” tourism in this region has increased immensely. Also property values have increased also. Toscana comprises a very large area. Plan on a week or more to visit the many wonderful sights. The food, climate and sights are exhilarating. Hills and valleys, morning fog that burns off quickly in the sun. So much to see and feel.
. The movie with Diane Lane helped increase it’s popularity with visions of sunflowers and rustic homes. There are many towns, cities, and regions the compromise Toscana. Florence is a good place to start. 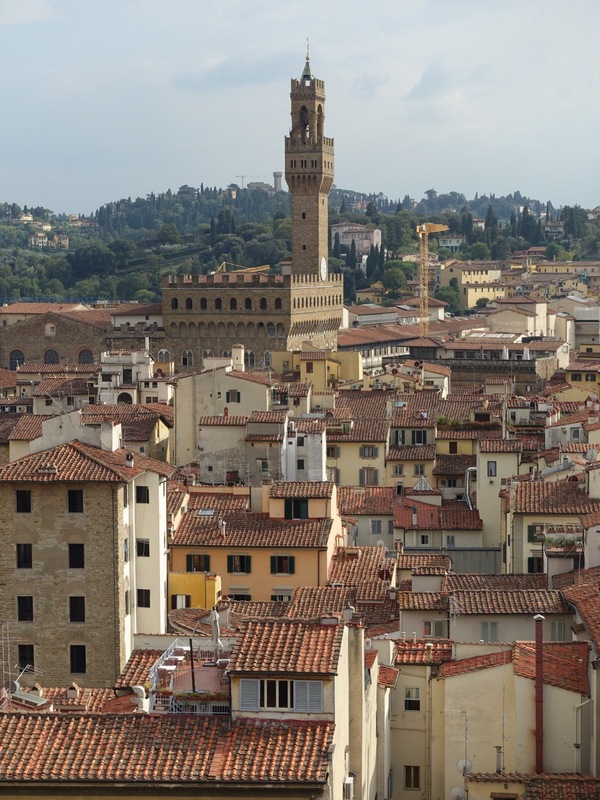 Florence or Firenze is the capital of to Toscana. It is a pedestrian city and cars are restricted from the city center. Florence viewed from Piazzale Michangealo. 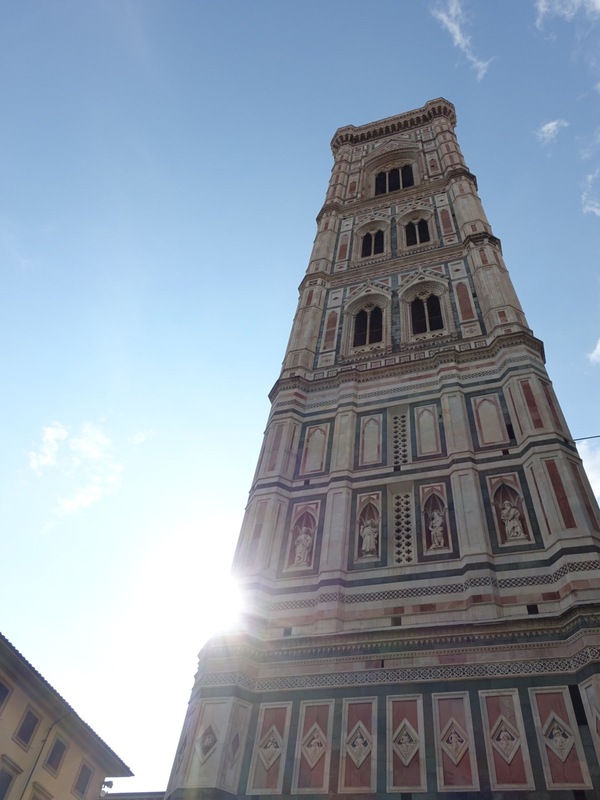 It is worth the walk across the Arno river and the climb up to view the setting sun. At this time people flock from all over the city to view it. You and have a glass of wine, or a café from any of the numerous bars nearby. I hurried to make sunset and see the spectacular vistas from this perch. 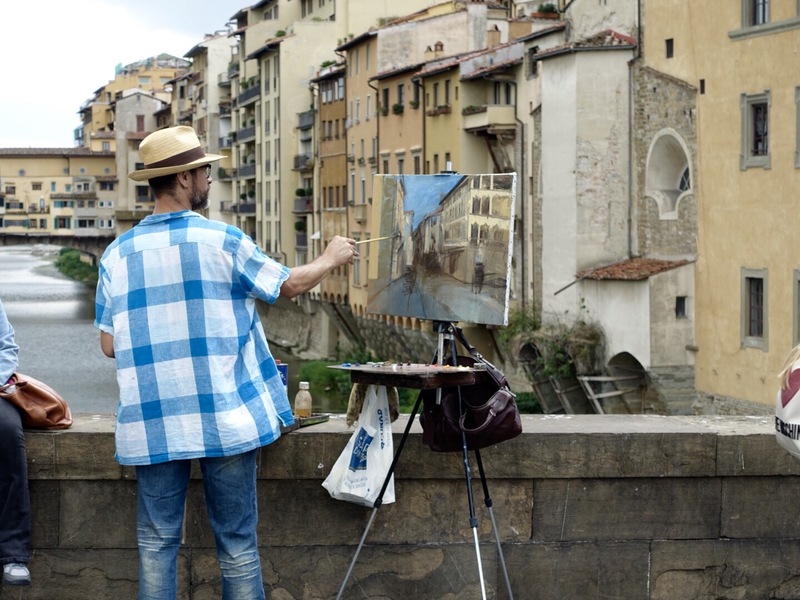 Am artist on the Arno river. Ponte Vecchio Firenze, night time is a great time to walk the city. 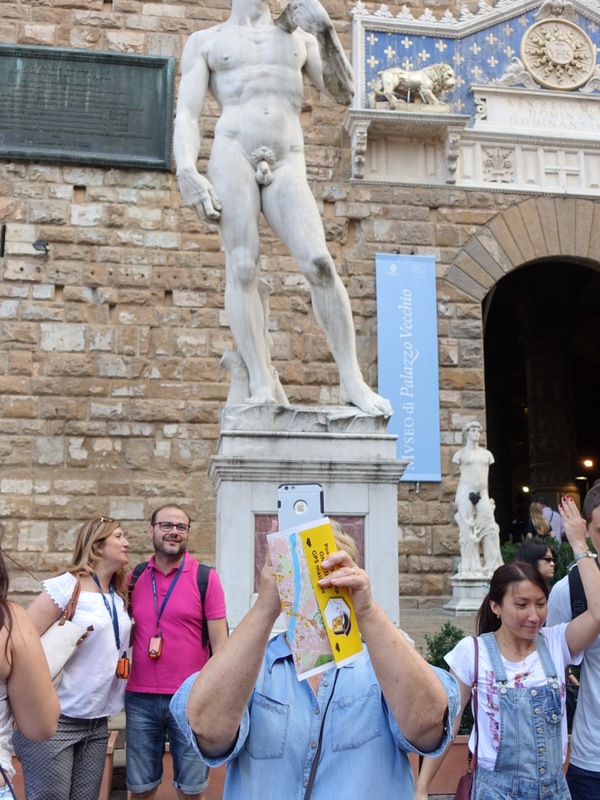 An artist work to restore a sculpture at the Uffizi which is a must see. Purchase your tickets in advance with an arrival time and skip the lines. Use the web for tickets. Served medium rare with a side of veggies. If you can visit Trattoria Pandemonio, Firenze. You will not be disappointed. So I signed up and started practicing climbing the hills in Vero Beach, Florida. Well not quite, there are no hills here. Best I could do is keep going over the two bridges that the connect the mainland to the barrier island. Add a back pack and some weight and it was a start. Our trip began in San Gimignano and ended in Pienza. Each day we biked 35-45 miles. By the end of our trip we have climbed more than 10,000 feet. The crowded roads we traveled on! Quick stop. Always beautiful views. Each morning Claudio and Elena would give us a briefing on our ride for the day. Each day brought new sights and some tough climbs. So much beauty. I stopped frequently to take photos. Monteriggioni, a beautiful walled village. Loved the shirt Elena was wearing. From the top of the tower, this where the Palio is held. Our rides took us through the town and alleys. Another amazing duomo. One of our rides from SanGimignano to Siena. As always when I am in Italy it is the Food. Fresh produce that has not traveled 3000 miles in a refrigerated truck. Always items that are in season. This was the best bruschetta I have ever had. The tomatoes were RIPE! The WordPress app for desktop computers does not like to work with my Apple Photos application. I have found several workarounds for this, mainly by opening the Apple Mail app and starting a new message. I then open the media browser and select the album that has the photos for the post I am composing. 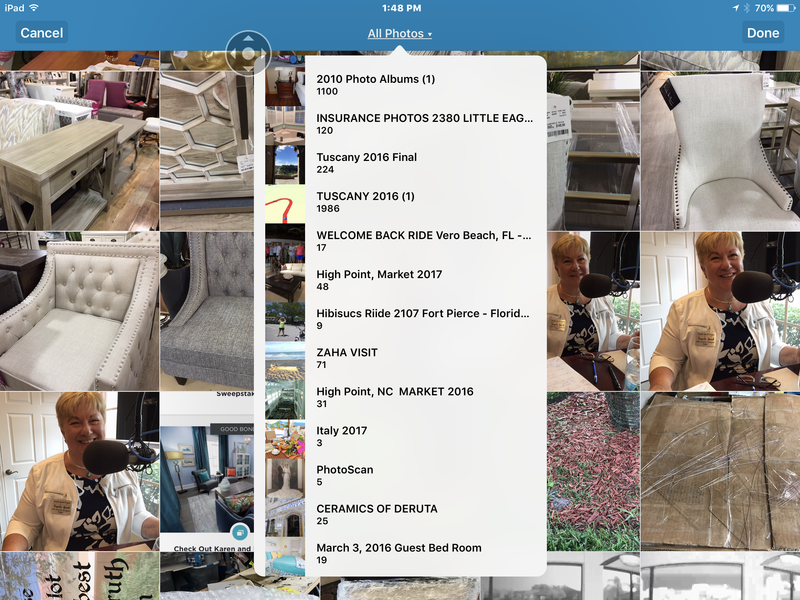 My photo library has over 30,000 images. That is difficult to manage worth the media browser for mail. But the WordPress app for IOS meshes nicely. I am able to choose from any of my albums. This is so much easier that the other method. Some photos taken last year in Firenze. Beautiful trip. Climbed up the campanelli and viewed the entire town. This year we are spending 51 days in Sicily and mainland Italy. We will be visiting Cefalù, Castello Buono, Siracusa, Gange, Lago di Garda, and almost three weeks in Roma. Can not wait.